[D] Dark Bind: 10 damage. 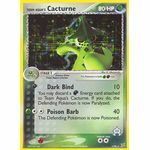 You may discard a Darkness Energy card attached to Team Aqua's Cacturne. If you do, the Defending Pokemon is now Paralyzed. [G][C][C] Poison Barb: 40 damage. The Defending Pokemon is now Poisoned. [D][C] Aqua Reverse: 20 damage. Before doing damage, you may choose 1 of your opponent's Benched Pokemon that has Team Magma in its name and switch it with 1 of the Defending Pokemon. Your opponent chooses the Defending Pokemon to switch. [W][W][C] Deep Impact: 40 damage. If the Defending Pokemon already has any damage counters on it, the Defending Pokemon is now Confused. 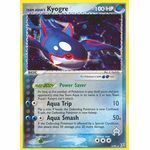 Poke-BODY: Power Saver: As long as the number of Pokemon in play (both yours and your opponent's) that has Team Aqua in its name is 3 or less, Team Aqua's Kyogre can't attack. [W][C] Aqua Trip: 10 damage. Flip a coin. If heads, the Defending Pokemon is now Confused. If tails, the Defending Pokemon is now Asleep. [W][W][C] Aqua Smash: 50+ damage. If the Defending Pokemon is affected by a Special Condition, this attack does 50 damage plus 20 more damage. 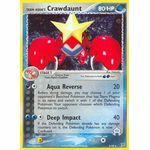 Poke-POWER: Power Shift: Once during your turn (before your attack), you may move any number of basic Energy cards attached to 1 of your Pokemon with Team Aqua in its name to another of your Pokemon. 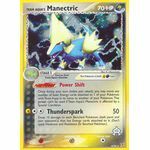 This power can't be used if Team Aqua's Manectric is affected by a Special Condition. [C][C] Rage: 10+ damage. 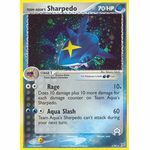 Does 10 damage plus 10 more damage for each damage counter on Team Aqua's Sharpedo. [W][W][C] Aqua Slash: 60 damage. Team Aqua's Sharpedo can't attack during your next turn. [W] Power Blow: 10+ damage. 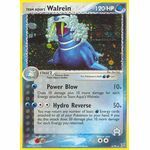 Does 10 damage plus 10 more damage for each Energy attached to Team Aqua's Walrein. [W][W][C][C] Hydro Reverse: 50+ damage. You may return any number of basic [W] Energy cards attached to all of your Pokemon to your hand. If you do, this attack does 50 damage plus 10 more damage for each Energy you returned.